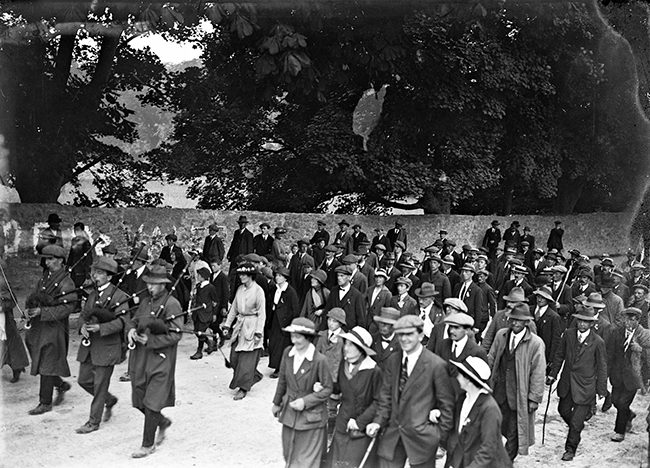 The first truly democratic election held in Ireland was the General Election of December 1918. 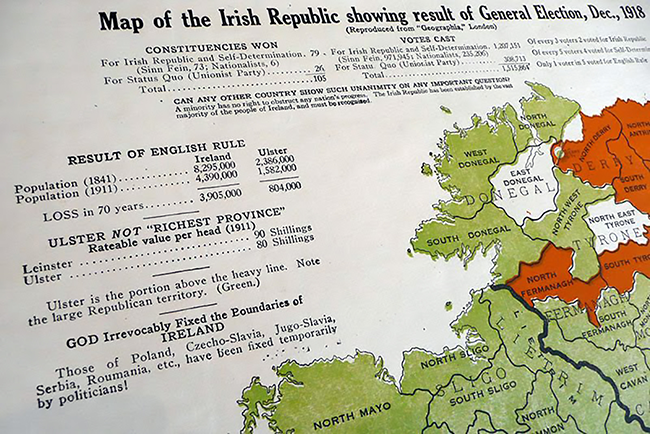 Seismic political events, including the Home Rule crisis, the World War, the 1916 Rising and the Conscription threat had shaken the country since the last General Election in 1910. Women had the vote for the first time, other restrictions on the universal right to vote had been removed and the widening of democracy helped to ensure a stunning victory for Sinn Féin on a Republican platform. Ireland elected 105 members to the House of Commons in the Westminster Parliament. They were elected in single-seat constituencies on the first-past-the-post voting system, as Westminster MPs are elected to this day. Since its foundation in 1905 Sinn Féin had advocated the withdrawal of Irish MPs from Westminster and the establishment of an Irish constituent assembly. It was only in 1917, in successive by-election victories, that Sinn Fein won Westminster seats and put its abstentionist policy into operation. The swing to Sinn Féin was not only because of the executions and mass imprisonments after the 1916 Rising; there was also growing opposition to Ireland's involvement in the war and its cost in lives, the inclusion in the British Cabinet of Tory Unionists who vehemently opposed any form of Home Rule, the threat of Partition and the ineffectiveness of the Irish Party at Westminster, led by John Redmond, increasingly seen as collaborators with British imperialism, as well as ongoing repression and press censorship. Redmond died in March 1918 and in April the British government introduced legislation to impose Conscription in Ireland. The Irish Party MPs withdrew from Westminster in protest, thus ending forever any significant Irish nationalist presence in that Parliament. Sinn Féin, the Irish Volunteers and the trade union movement took the lead in the anti-Conscription campaign. The Irish Party was also involved and it had three by-election successes in 1918 but the writing was on the wall. In East Cavan in June Sinn Féin's Arthur Griffith won a decisive victory on the abstentionist platform which Irish Party leader John Dillon had called 'a policy of lunatics'. It was widely predicted that Dillon's party faced heavy defeat whenever the General Election came. 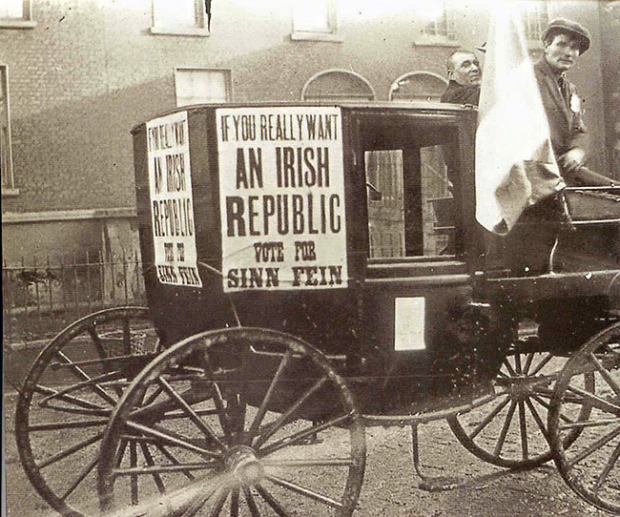 Well before the war ended, Sinn Féin's election preparations were under way. The jailing of many of its leaders in the British government's concocted German Plot did not deter the movement. In August 1918 General Secretaries Harry Boland and Tom Kelly reported to the Ard Chomhairle that there were over 1,600 cumainn throughout the country. The same meeting endorsed a motion to contest every seat in the General Election “in order to give every Irish voter the opportunity of voting for or against the establishment of an independent Irish Republic”. By the time of the Sinn Féin Ard Fheis in October 1918, many candidates had already been selected, a process overseen by Harry Boland, based at the movement’s Head Office in 6 Harcourt Street, Dublin. That same month the electoral register was revised to take account of the widened franchise. Women over 30 could vote for the first time and remaining property qualifications for men over 21 were removed. 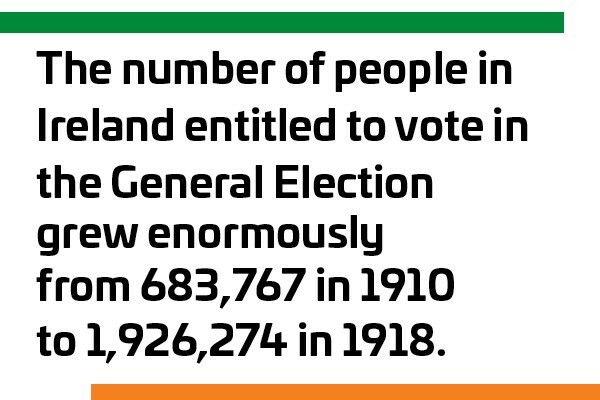 This meant that the number of people in Ireland entitled to vote in the General Election grew enormously from 683,767 in 1910 to 1,926,274 in 1918. "The majority of the working men and women of Ireland were members of Sinn Féin or the Volunteers or Cumann na mBan, and, as the disciples of James Connolly, held that the freedom of the nation and the freedom of the working classes must be pursued as one undivided aim." (‘The Irish Republic’). The war ended on 11 November and the British Parliament was dissolved on 25 November. Polling days was set for 14 December. The Sinn Féin manifesto reflected the republican position adopted by the Ard Fheis a year previously and stated that the party "gives Ireland the opportunity of vindicating her honour and pursuing with renewed confidence the path of national salvation by rallying to the flag of the Irish Republic". It was committed to establishing the Irish Republic by withdrawing Irish representation from Westminster, using “any and every means available” to make British rule impossible, establishing a constituent assembly and appealing to the post-war Peace Conference to recognise Ireland as an independent nation. It roundly condemned the role of the Irish Party in collaborating with the British government and attempting to “harness the Irish people to England’s war chariot”. 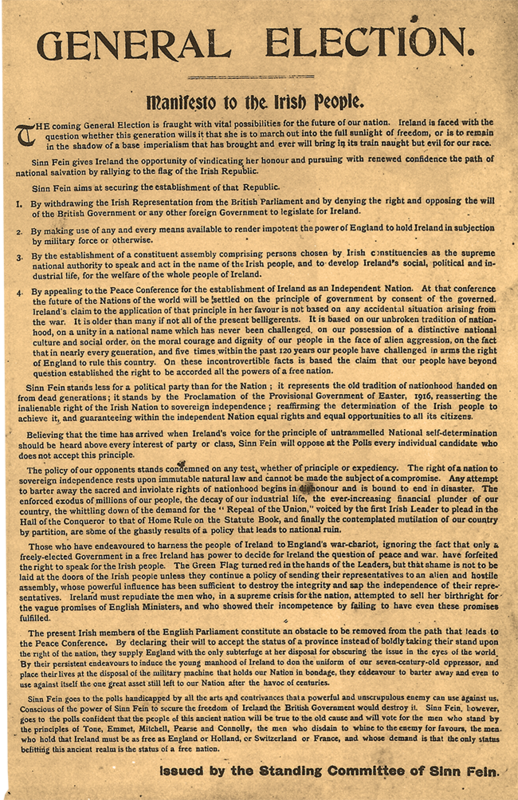 The Manifesto endorsed the 1916 Proclamation “guaranteeing within the independent Nation equal rights and equal opportunities to all its citizens”. 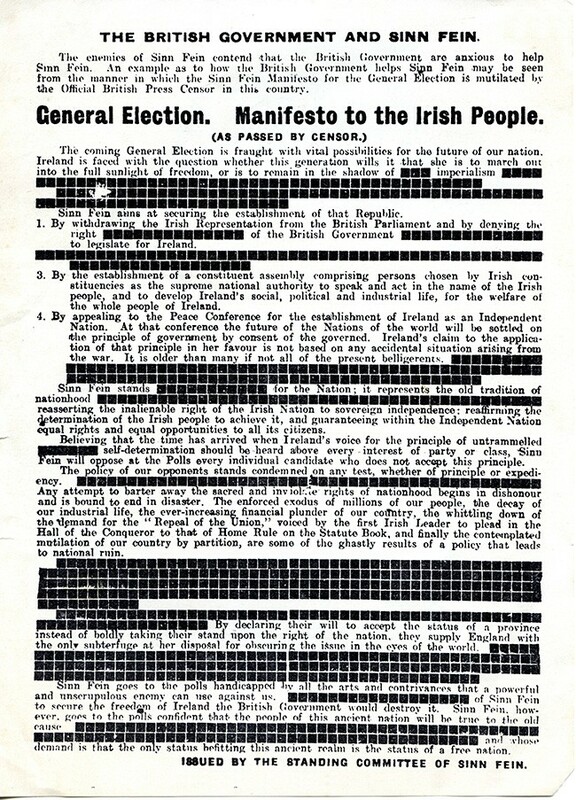 The manifesto was censored by the British authorities when it appeared in the newspapers but the full version was widely circulated. Nominations were due to close on 4 December. In North-East Ulster the Catholic bishops suggested that Sinn Féin and the Irish Party should not split the nationalist vote in seats where this would allow a Unionist to win. Sinn Féin proposed that a plebiscite be held among nationalist voters in these constituencies. Dillon rejected this in talks with Sinn Féin representative Eoin Mac Néill. The latter acceded to a call for the Catholic Cardinal Logue to propose a four-four division of eight seats between the two parties. Others in Sinn Féin criticised Mac Néill for not adhering to his instructions. Sinn Féin candidates remained in the race in three of the four Irish Party-allocated constituencies but did not campaign and their voters were urged to support the Irish Party to keep the Unionists out. In taking this position the need to oppose the British threat of Partition was very much to the fore. When nominations closed it was realised that 36 outgoing Irish Party MPs were not contesting the election and in 25 constituencies, 17 of them in Munster, the Sinn Féin candidates were unopposed. Sinn Féin contested 103 of the 105 constituencies (the exceptions were Trinity College Dublin and North Down). Harassment continued right up to polling day with raids and arrests, seizure of Sinn Féin election material and removal of posters by British crown forces. After the death in Usk Prison, Wales, on 9 December of republican prisoner Richard Coleman, Sinn Féin campaigners wore black crepe on candidate badges. In 'The Four Glorious Years' Frank Gallagher says a final election rally filled Dublin's O'Connell Street with speakers on several platforms, each flying a Tricolour with a black cross for Richard Coleman. He describes how on polling day Dublin dockers marched to the polling station behind an advance guard of Citizen Army veterans and hundreds of workers at the new British aerodrome at Collinstown – now Dublin Airport – went to the polls in a fleet of lorries flying Tricolours. There was a two-week gap between polling day and the announcement of the final results on 28 December. Sinn Féin had won an overwhelming victory, taking 73 of the 105 seats in Ireland. Unionists won 26 and the Irish Parliamentary Party six (down from 80). The majority vote for Sinn Féin was 70 per cent: 24 of the 32 Counties returned only Sinn Féin TDs. Of Dublin's 11 TDs, all but one were Sinn Féin. The myth of nine-county Ulster being Unionist was exposed. Unionists polled a majority in Antrim, Armagh, Derry and Down but there were nationalist majorities in Cavan, Donegal, Fermanagh, Monaghan and Tyrone. 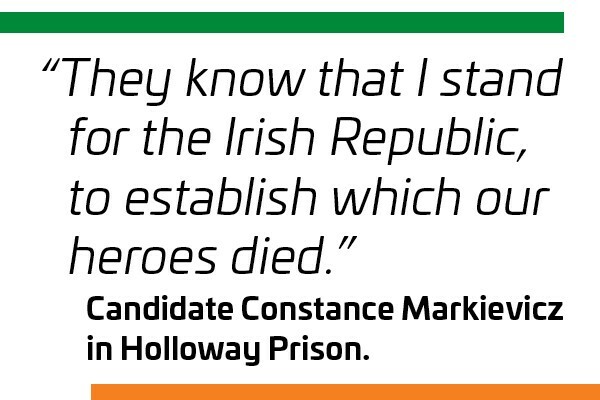 Constance Markievicz was the only woman elected in Ireland and Britain and would go on to be one of the first women government ministers in the world in the First Dáil Éireann. Preparations for that Dáil, the democratic assembly of the Irish Republic so strongly mandated by the electorate, began soon after the General Election that transformed Ireland 100 years ago.